Since I became certified, maybe even before, the talk of the town, the prime dive destination for the entire Gulf of Mexico, was the Florida Keys National Marine Sanctuary. How could I spend an entire summer in Florida without seeing it? And so began the eight hour long journey, via my antiquated Volvo, to explore it. Dive Charter: Quiescence Diving Services, Inc. The Florida Keys National Marine Sanctuary covers the length of the Florida Keys, protecting 2,900 square nautical miles of coral reefs, mangroves, and sea grass beds. The reef is the world’s third largest barrier reef. The sanctuary is a prime example of multiple use management. This means that some sites are open to recreational fishing, snorkeling, and SCUBA diving, while other areas are closed off completely. Some areas, for example, may be open for indirect uses, such as snorkeling and diving, while others are open to direct uses such as spearfishing and recreational fishing. In 1960, long before the National Marine Sanctuaries Act, John Pennekamp Coral Reef Park was established as the world’s first underwater park. This designation set a precedent for protecting key areas along the Florida Keys, such as the 1975 designation of the Key Largo National Marine Sanctuary and the 1981 designation of the Looe Key national Marine Sanctuary. 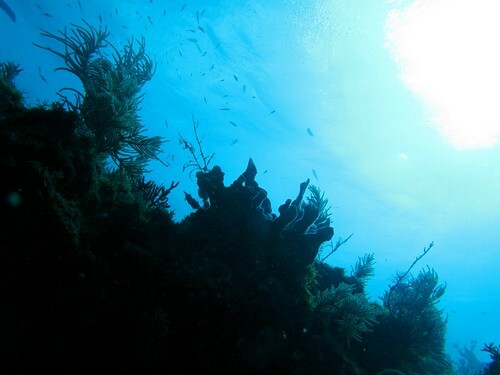 Finally, in 1990, after signs of deterioration and growing human threats became apparent, the Florida Keys National Marine Sanctuary was established to protect the entire region, incorporating the two previously designated sanctuaries. By designating the area as a national marine sanctuary, it is protected from oil exploration and development, excessive or large shipping traffic, anchoring, and other extractive activities (coral collecting, certain types of fishing, fishing in certain areas, fish collection, etc.). 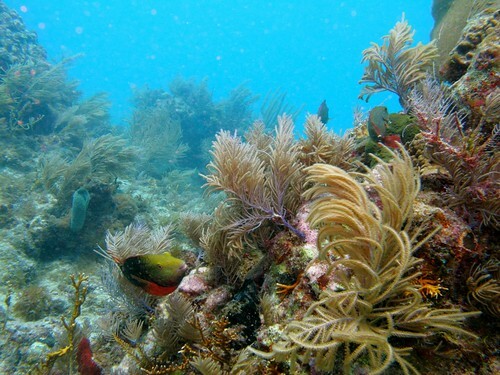 Unlike the Flower Garden Banks National Marine Sanctuary, the Florida Keys has shallow water reefs. Most of the dive sites are less than 35′ in depth, which is great for visibility and important coral growth. Unfortunately, this also means that storms and other weather events can significantly impact your diving experience. When I arrived on Friday, I received a call from the dive resort informing me that all weekend dive trips had been cancelled due to weather. Driving across the bridge, I could see white caps on the waves and knew that conditions could be rough further out from show. Nonetheless, I called another dive charter in Key Largo and booked myself for a day of diving. On Saturday morning, the dive charter, Quiescence Diving Services, was the epitome of responsibility. Due to the 6-8′ waves, no snorkeler was allowed onboard. All divers were informed, multiple times, that the conditions would be challenging at best. Insistent, I boarded their small vessel with five other divers (max occupancy of six divers per boat). The captain skillfully took us out into the ocean, with waves rising as high as the boat at times. He assisted each diver with putting on his or her equipment… and then we back-rolled into the sea. Despite the strong surge, pushing us forward and backwards, the visibility was perfect, allowing the sun to shine down and highlight the colorful corals. 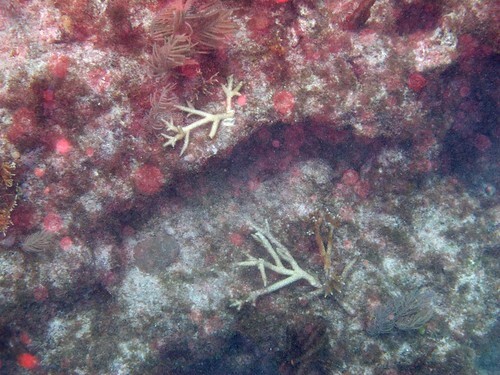 Browsing through the photographs above, one can see that the site is dominated by soft corals – sea fans and sea whips. 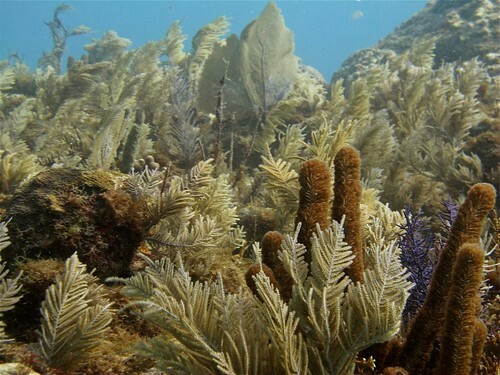 The corals swayed gently back and forth with the sage, like trees swaying in the wind. 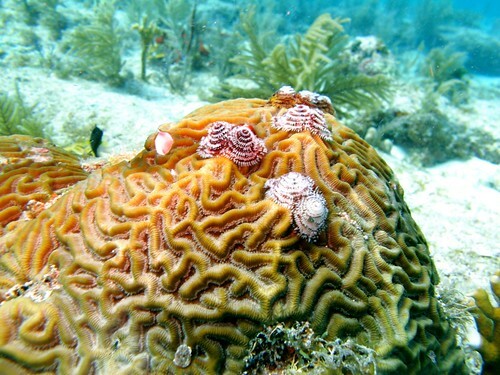 Hard corals, like the brain coral, also covered the site, providing the strong and stable support necessary for reefs. Hard corals, also known as stony corals or hexacorals, are the primary reef building corals. They build reefs through the secretion of calcium carbonate “skeletons”, which, once the coral ages and dies, provides a solid foundation for continued reef building and growth. 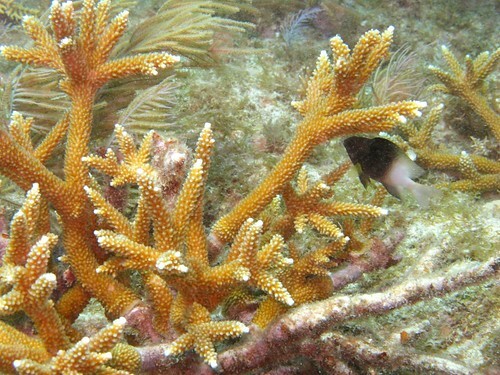 The Elkhorn coral (Acropora palmata), pictured above, is a prime example of a reef building coral. 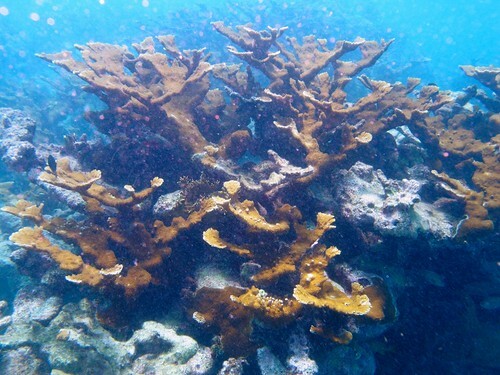 In the photograph, the vibrant orange branches of Elkhorn are growing on top of and branching from the purple-gray hued skeleton of previous Elkhorn coral. Elkhorn coral and Staghorn coral (Acropora cervicornis) are two of the most important reef building corals, and also two of the most endangered. Even though both corals are hard corals, they form via a delicate branching structure, which can easily become broken from passing, careless divers, or from natural events such as hurricanes. Coral bleaching and disease also threaten these species. Boulder star coral (Montastraea annularis) is another important reef building coral, due to the massive and solid structure it creates. 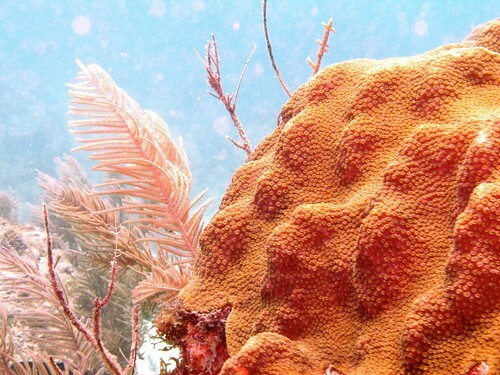 It is easily recognizable by its “star shaped” coral polyps. Although it is one of the most abundant reef building corals, it is listed as Endangered by the IUCN and is threatened by coral disease and bleaching, damage from humans and natural events, and over-grazing by Stoplight Parrotfish. Stoplight Parrotfish (Sparisoma viride) are colorful, large, and distinctive reef fishes, and one of my favorite! 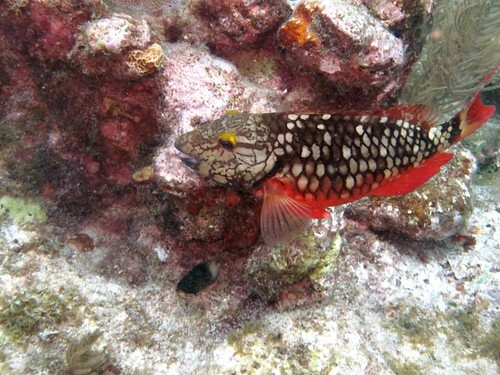 The Stoplight Parrotfish appears above in its initial phase, with dominant red and black/grey colors. As it ages, it becomes shades of green and blue. Parrotfish can be found in reefs grazing on the coral and algae, making them both important but potentially threatening herbivores. Parrotfish may over-graze coral, leading to its destruction, or graze on algae, which allows coral to flourish in its place. The reefs revealed other important indicators of a healthy and safe coral reef ecosystem. 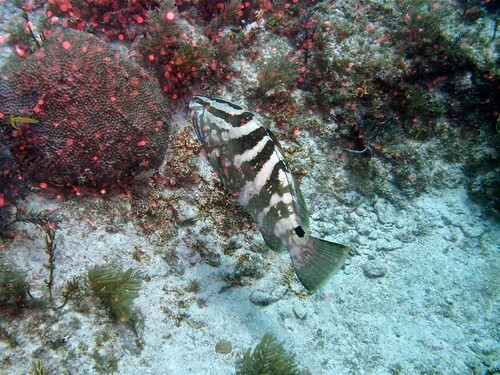 The Nassau Grouper (Epinephelus striatus) is listed as Endangered by the IUCN due to heavy overfishing over the years. I have never seen one alive, so this was a really exciting find! He did not seem to enjoy being photographed, but I managed to snap this shot before he disappeared into the reef, dark stripes fading to blend the entire fish into the sand. 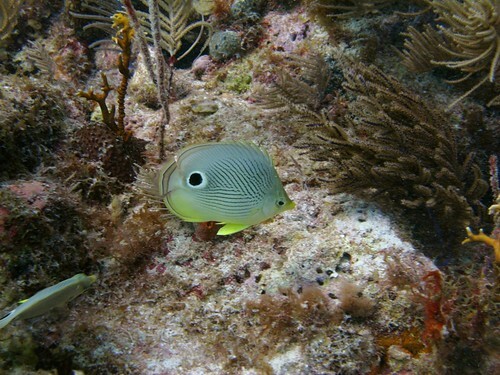 Butterflyfish are considered another important biological indicator for reef health. Foureye Butterflyfish (Chaetodon capistratus) are a common species found throughout tropical waters. Although their diet is varied, some butterflyfish feed specifically on coral, using their narrow mouth to gently nip the polyps, without significantly damaging the entire coral. When a reef is not healthy, and, consequently, coral becomes less abundant, it is suspected that butterflyfish whose diet primarily consists of coral will also become less abundant. Those remaining, on the other hand, will become more territorial and display such signs of aggression. This trip further marked my first sighting of an adult Hogfish (Lachnolaimus maximus), a fish named for its hoglike behavior and it pokes around in the substrate with its snout in search of a meal. They are a colorful species, with a range of patterns and colors. Generally, a darker patch covering the forehead distinguishes the males from the females. Hogfish are actually a type of wrasse and are targeted by recreational fishermen and spear divers due to their large size. 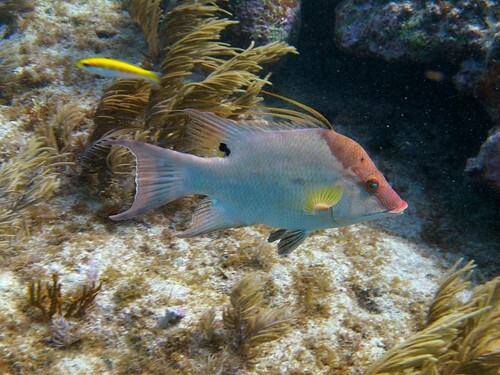 Although there are limits on the size of the fish and type of gear used, Hogfish are listed as “Vulnerable” by the IUCN. In the unprotected waters near Tampa, juvenile species were common but I never once saw an adult. I thought it interesting that my first sighting of a full grown adult occurred in the protected Florida Keys waters. Despite the challenging conditions, eight foot waves and a strong surge, the overall dive experience was enjoyable. For the first time, I could visualize the significance of the Elkhorn and Staghorn corals as reef builders, I could understand both from papers and from experience the appearance of a functioning, healthy reef. Alternatively, I could also see that, while activities such as diving financially support an industry that protects fragile and ecologically important sites, it also causes damages. As I explored the reef, careful not to inadvertently damage any reef while attempting to capture its beauty in a photograph, I discovered areas littered in the shattered fragments of hard corals. Although the true cause of such destruction could not be determined, it represented the potential consequences of careless diving and other adverse human impacts. The slow growth of hard corals has led to the critically endangered status now placed upon Elkhorn and Staghorn corals, as researchers struggle to find ways to rebuild and maintain these corals. Hurricanes, overgrazing from parrotfish, and coral disease are just some of the natural threats these corals face, in addition to the impacts of fishing gear and careless divers. Despite these apparent threats, the reefs were undoubtedly some of the healthiest I have observed in the Gulf, perhaps only rivaled by the protected deepwater reefs of the Flower Garden Banks National Marine Sanctuary. Although sanctuary status cannot protect from all harm, especially not ocean wide effects such as pollution and warming waters, it certainly helps to some degree, to allow reefs to flourish and yet still be explored by curious divers and snorkelers.